I don't think that there is bear in this cave, Terry is not moving fast enough! 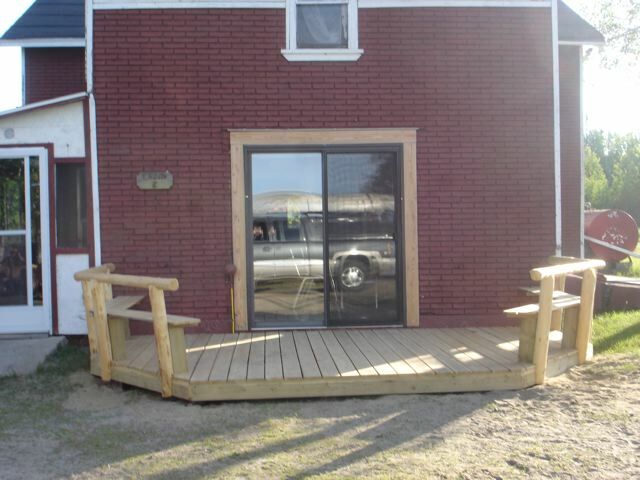 Cabin 2 now has a new deck for your enjoyment. 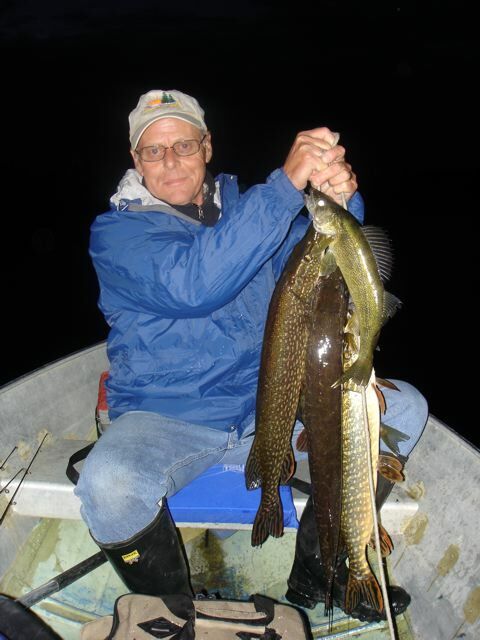 Chuck and Terry with a nice catch. 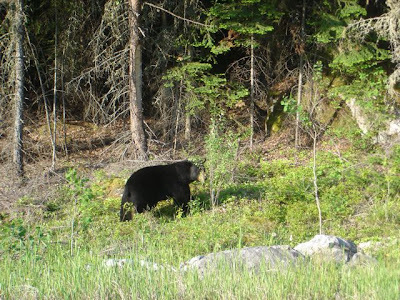 This large Black Bear was sighted near Paquette's Camp while the guys were up on their annual fishing trip. The wildlife veiwing was good , with many bear and moose being seen throught out the week. 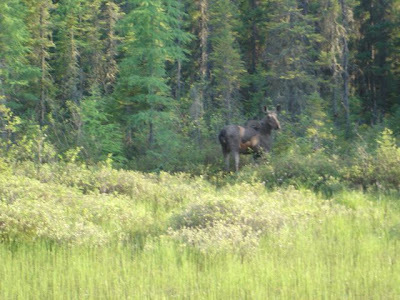 We never get tired of seeing Moose, does not matter wether it is a cow or bull they are all quite a sight! Terry with another Northern Pike, are we having fun yet? It does not get much calmer than this, not the best for fishing but great for pictures! 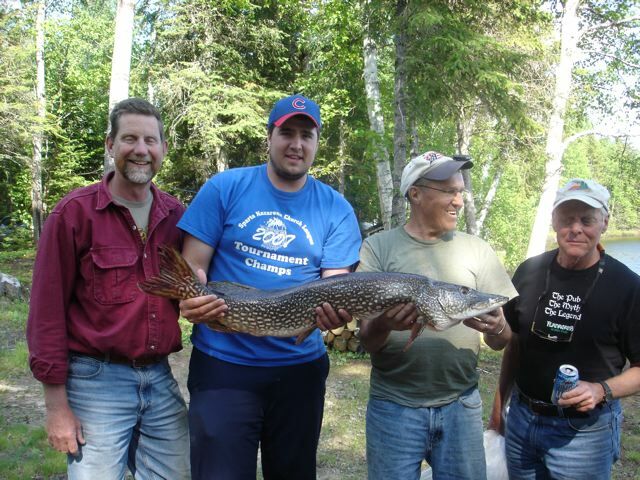 Of course it is the guy looking away from the camera that caught the fish, come on Moose this fish is nothing to be ashamed of. Dennis and his fishing buddies, hope to see you all again next year, of course I will be seeing most of you again in August! 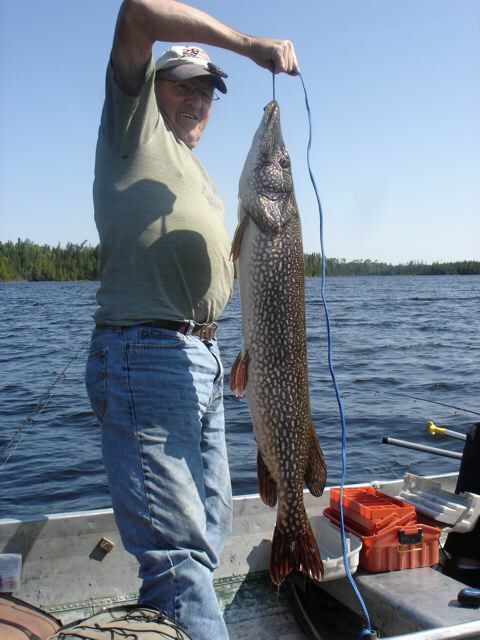 Moose (not his real name) shows off his 20 pound Pike, caught in an unamed lake near Paquette's Camp. We are well into the season here now and things are going well. The weather has been cold and wet, we went from 85 degrees one day to frost that night, however the fish are still biting. I have been building decks on cabin 2 and cabin 7 this week,trying to keep up on the lawn , get the garden in, and of course knowing how short the summer can be working on the wood pile. The kids must be bored or tired of the cold weather and trying to warm up, they are coming up with projects like a makeshift sauna. 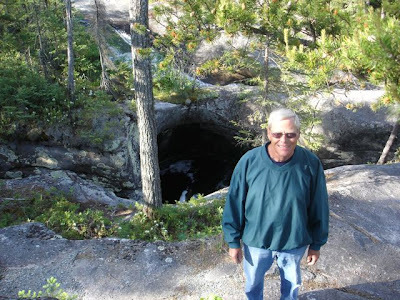 I was impressed with their work on it and especially how well it worked, and the fact that they did not burn themselves moving the hot rocks into it. No this is not a tent, the kids decided they needed a sauna, so they built a tempary one. Rocks are being heated on the fire as the construction continues. The makeshift sauna...not complete yet; we found an old canvas tent to put on top of it. Kids: don't try this at home! Our campfire must not be warm enough, still need winter clothes and gloves to be warm. Logan is having a good day , this is just one of several he has caught today. Logan has a fish on ,the question is wether he will land it or not. 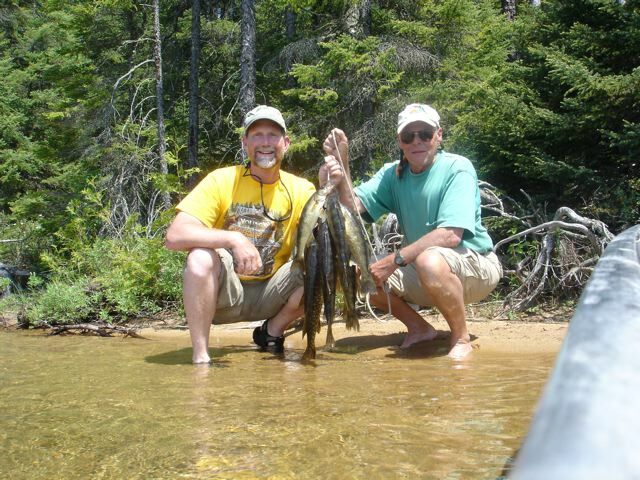 Fishing was good, this is not the first time that day we were catching them 2 or 3 to a time. 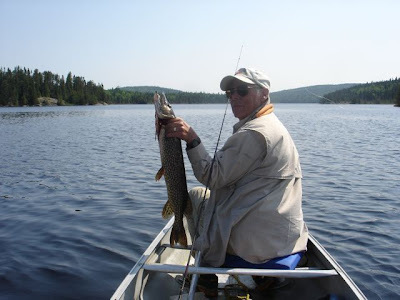 Goeff caught this nice Northern Pike on a recent trip to Paquette's Camp, note that he is holding it out so that it looks bigger than it really is. Spring is finally here and we are open for buisness again. The ice went off the lake on May 8th, and the weather turned nice for a few days then. Along with the nice weather it also brought the Bears out and we had one that was a bit too freindly and had to be trapped and relocated. It is nice not to get woken up in the middle of the night by it now. The first group of fishermen were here last week and had a good week, with decent weather and some nice fish. 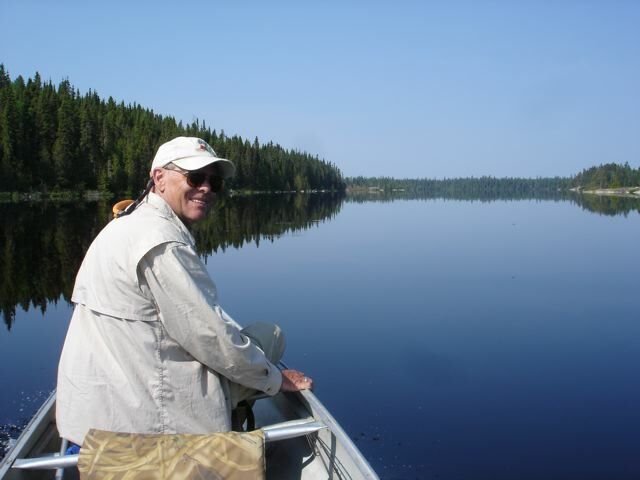 Everyone here this week has been fighting the wind and hardly able to fish. The wind has finally stopped this morning, I have boats sunk at the docks, things tipped over all over the camp, but at least no trees down. I think I can get the boatsd out today and get things cleaned back up. I went out with the Ministery of Natural Resources to look at the improvements that were made to the Walleys Spawing Beds, it was nice to see that there were fish spawning in all of the areas we worked on. Hopefully we can make more improvements this coming winter (not that I want to rush winter) . To all those coming up in the next week, the Black Flies are Out. This bear was on our deck the last 3 nights, and starting to be a problem, he is caged and ready to be relocated now. Mabye we can get some sleep tonight. 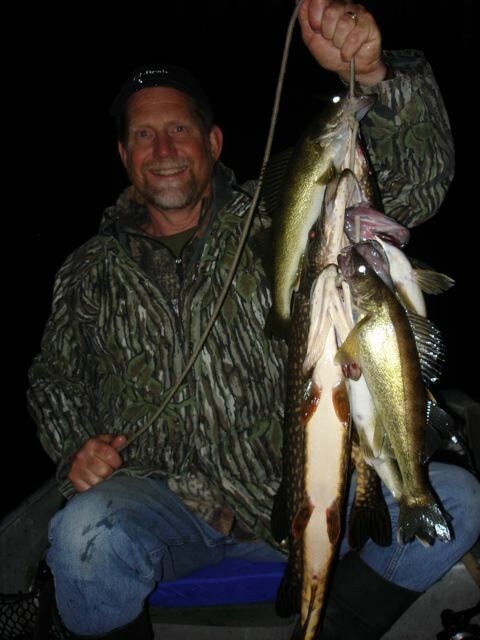 The first group of the year found some nice Walleye. Dale with the catch of the evening.